With the aroma of incense and the sounds of hymns, a mass of men and women clad in Catholic robes gathered around West 50th street and 9th avenue in the Hell’s Kitchen area of New York City on the the first Sunday of September. Most men were wearing dark purple robes with golden medallions, others wore black and white. A group of about fourteen men carried a massive carriage on their shoulder with a statue of a man standing amongst ornate flower arrangements. Curious onlookers, including this author, whipped out their smartphone cameras to capture what was undoubtedly some sort of religious special event. Instagram first, ask questions later. 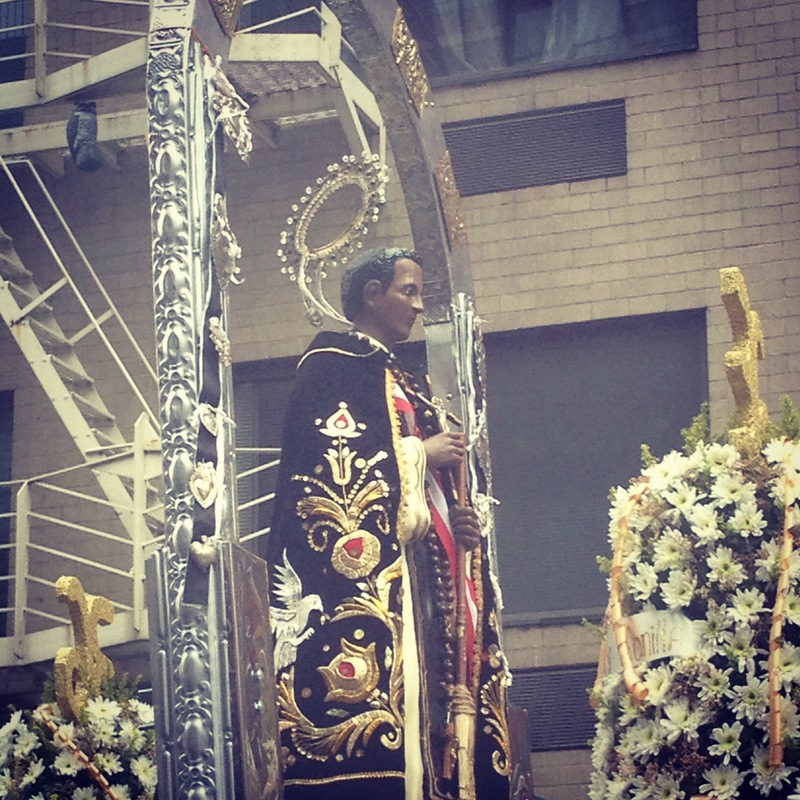 Far from a funeral, the elaborate procession was the New York feast day parade of San Juan Martín de Porres of Peru, who was the first black saint from the Western Hemisphere. Born in 1579 in Lima, Peru, Martín de Porres was the illegitimate son of a freed slave woman and a Spanish knight. Lupe, a friendly older woman saw me wandering around and took it upon herself to tell me Saint Martin’s history in the best English she could manage. Martín endured a life of poverty and ostracism due to his status as a mulatto. However, he decided in his teens to join a Dominican order. Legend has it that Martin had extraordinary abilities to care for and cure the sick and ailing. Legend has it that he able to pass through locked doors in order to attend to the sick. Martín de Porres was indeed canonized by Pope John Paul XXII in 1962, perhaps as a nod to the struggle for black civil rights in the United States. 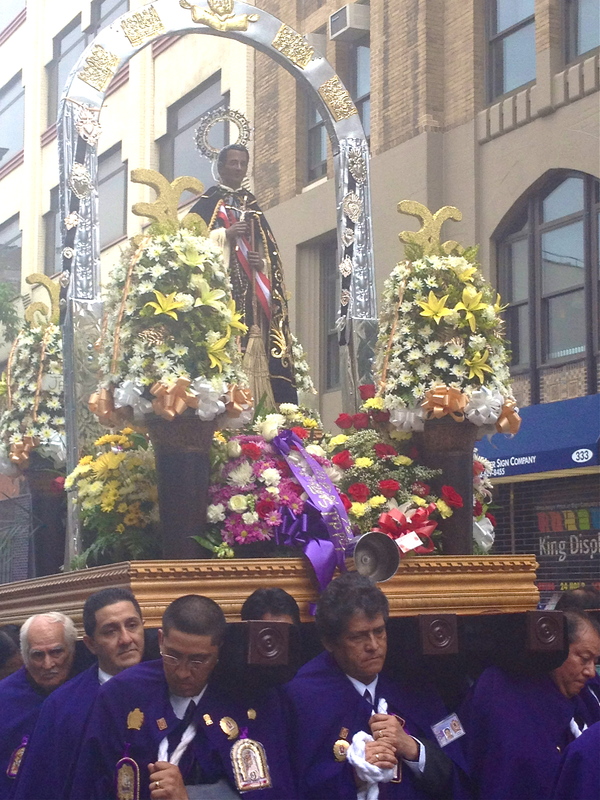 The Fraternidad de San Martín de Torres of New York celebrates Saint Martín’s feast day every first Sunday in September, according to Carlos Fuentes, a member of the Brotherhood of Miracles (Saint Martin is their patron saint) and a participant in the procession. “In Peru, they actually celebrate his day in November, but here in New York, we do it earlier in September.” Saint Martin is the patron saint of inkeepers, barbers, and of mixed race peoples, and is one of the chief patron saints of Peru. New York and New Jersey is home to a large number of Peruvian immigrants, a large number of whom are Roman Catholic.